Bariatric surgery (weight-loss surgery) includes a variety of procedures performed on people who are obese. Weight loss is achieved by reducing the size of the stomach with an implanted medical device (gastric banding) or through removal of a portion of the stomach (sleeve gastrectomy) or by resecting and re-routing the small intestines to a small stomach pouch (gastric bypass surgery). Several recent studies reported decrease in mortality and severity of medical conditions after bariatric surgery. In the Swedish prospective matched controlled trial, patients with a body mass index (BMI) of 34 or more for men and 38 or more for women underwent various types of bariatric surgery and were followed for an average of 11 years. Surgery patients had a 23.7% reduction in mortality (5.0% vs. 6.3% control). A study done at Gem Hospital on the effects of Sleeve gastrectomy and gastric bypass showed a three-fold improvement in the quality of life of patients following the procedure. Similar trends have been shown by different studies across the continents. Hence, bariatric surgery not only helps in increasing the overall survival, but the overall quality of life of an individual. The U.S. National Institutes of Health recommends bariatric surgery for obese people with a body mass index (BMI) of at least 40, and for people with BMI 35 and serious coexisting medical conditions such as diabetes. However, research is emerging that suggests bariatric surgery could be appropriate for those with a BMI of 35 to 40 with no comorbidities or a BMI of 30 to 35 with significant comorbidities. But recent studies have shown that the Asian population especially Indians have on average more visceral fat than normal and hence more predisposition to diabetes and other metabolic disorders. Hence at a same BMI, Indians are more prone to development of obesity related T2DM than our western counterparts. This criterion has now been accepted as the standard for selection of patients in Asia. Bariatric surgeries work by two mechanisms. One is restriction i.e. reduced capacity to eat at one particular point of time and 2.Malabsorption .All the procedures combine one or both the mechanisms in a variable manner and accordingly the procedures are classified as follows. They work by reducing the volume of the stomach hence by the patient achieves satiety much earlier. Vertical banded gastroplasty has been abandoned due to inadequate results and the more accepted procedures have been Lap banding and Sleeve gastrectomy. In Lap banding, the restriction of the stomach is created using a silicone band, which can be adjusted by addition or removal of saline through a port placed just under the skin. This operation is performed laparoscopically and is commonly referred to as a "lap band". Weight loss is predominantly due to the restriction of nutrient intake that is created by the small gastric pouch and the narrow outlet. It is considered one of the safest procedures performed today with a mortality rate of 0.05%. Type 2 diabetes mellitus is an important component of metabolic syndrome which includes obesity, hypertension and dyslipidemia. The concept takes origin from Bariatric (also called Obesity surgery) which was initially intended to treat Obesity permanently. But it was noticed that most patients with diabetes, this was completely cured over a follow up of 10-15 yrs. Further research and scientific data both from our Institute and other pioneer institutes in the world have shown that, this was related to certain hormonal changes which bring diabetes under remission on a permanent basis. Hence this hormonal concept was further studied and the results have shown promising results in control of diabetes even in patients using large doses of insulin and also inadequate control in-spite of various medication usage. Hence this is ideally suited for those patients who want to get rid of their insulin shots and also not able to achieve diabetes remission in-spite of maximum medical therapy. Especially with India becoming the diabetic capital and more and more usage of insulin this diabetic surgery is possibly the only solution in this subgroup of patients. A recent Level I evidence that compared Bariatric surgery and medical therapy has clearly shown that surgery for diabetes provides most effective diabetic control in the short and long term compared to medical therapy. GEM Obesity & Diabetes Surgery Centre holds pride to have performed the largest numbers of such surgeries in Asia and the only centre experienced to perform all kinds of such operations including novel procedures like Laparoscopic Duodenojejunal bypass, Laparoscopic ileal Interposition etc. It is one of the most commonly done procedures. It is a surgical weight-loss procedure in which the stomach is reduced to about 25% of its original size, by surgical removal of a large portion of the stomach, following the greater curvature. The procedure permanently reduces the size of the stomach. The procedure is performed laparoscopically and is not reversible. Most patients can expect to lose 70-80% of their excess body weight over a 6–12 months period with the sleeve gastrectomy alone. In addition, the improvements in associated diabetes, hypertension, dyslipidemia, menstrual irregularities etc also improves significantly. Dr.Praveen Raj & team have performed more than 3000 of these procedures with Nil complication rates making it the safest surgical centre in the country today. The classical example of this is the Laparoscopic Roux en Y Gastric Bypass which is considered to be the gold standard procedure of today. Long term data has shown that this combination of procedures have been most effective in weight loss remission and also in resolution of T2DM, in fact all components of metabolic syndrome. The gold standard has been Roux en Y gastric bypass which has stood the test of time with T2DM resolution of >85% after a mean follow up of 14 years. 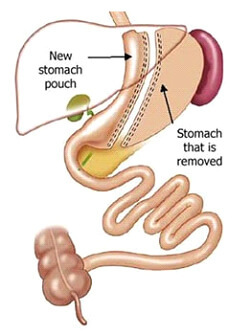 Re-construction of the GI tract to enable drainage of both segments of the stomach by connecting directly to the intestines is performed using staplers. The surgery has proven to be very effective in weight loss, even in the super-obese (BMI>50) and in patients suffering from uncontrolled diabetes, hypertension and Gastro-Oesophageal Reflux Disease (GERD). A procedure introduced in Gem Hospital which combines the benefits of the above mentioned sleeve gastrectomy and gastric bypass. This procedure involves creating a sleeve gastrectomy as described above and bypassing a part of the intestine by connecting the jejunum and the duodenum. The procedure helps in significant weight loss(>80% of the excess weight) and resolution of even uncontrolled diabetes. The mini-gastric bypass procedure has gained popularity in recent years. The mini-gastric bypass was initially developed to reduce operating time, simplify the procedure and reduce complications. 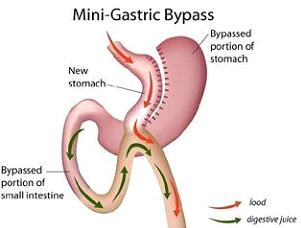 The mini-gastric bypass procedure is restrictive and malabsorptive. This means that the procedure reduces the size of your stomach, restricting the amount you can eat. The procedure also reduces absorption of food by bypassing up to 6 feet of intestines. Revolution doesn't happen every day. It sometimes takes decades. The introduction of laparoscopy to surgery is one such revolution, wherein a patient who earlier required a long opening in the abdomen to get a surgery done to staying in the hospital for days, and taking months to recover, now just requires just a couple of days to completely recover, sometimes even requiring just a few hours only and this has been 3 decades since its introduction with multiple levels of evolution in techniques and technology. The Revolution Next in surgery is the usage of Robotic technology in surgical practice. Does Robotic Surgery mean automation using artificial intelligence? The answer is a BIG NO ! Unlike robotic technologies in industrial use wherein this holds well, this is not the case in surgery. In robotic surgery, the surgeon still holds complete control, with the robot being an aid to enable better and safer surgery by the magnification, precision and dexterity it provides enabling better access of organs, structures and tumuors translating into better outcomes. Hence surgical expertise and experience is of paramount importance. How is it different to conventional laparoscopy? Robotic surgery is the next step in laparoscopy. Like laparoscopy, the surgery is performed using small holes but instead of the surgeon directly controlling the instruments, he operates via a console where his movements would be reciprocated via the robotic equipment. The inbuilt safety mechanisms prevent unnecessary movements of the instruments reducing the chances of organ injury and complications. Also the movement of the instruments is more precise filtering any kinds of tremors making the removal of the pathologies more accurate. How is this advantageous to the patients? Unlike in conventional laparoscopy wherein the ports(access through which the instruments are inserted) move around the abdominal wall during the course of the surgery , in robotic surgery this movement is significantly less as the movements are around the robotic wrist within the abdominal cavity. This reduces the chances of abdominal trauma, hence the associated pain and wound healing. As described earlier, it enables more precise surgery making the removal of the pathologies especially tumours with more accuracy. Gem Hospital is the only institute to be equipped with the Da Vinci robotic technology among all the gastroenterology specialty hospitals in the country, in addition to being equipped with the 4K and 3D laparoscopy. The interest in endoscopic treatment of obese patients is growing as a result of the technical development of endoscopic devices and because several studies have shown that most patients do not need the substantial weight loss afforded by bariatric surgery. There are a whole range of endoscopic procedures used as weight loss treatments. With a new generation of endoscopic equipments available, endoluminal bariatric weight loss surgery is gaining popularity as well. Although not comparable to conventional laparoscopic techniques, they have shown up to 40% reduction in excess weight loss and around 60 % resolution of co-morbidities. Few of the available procedures include intragastric balloon, endoscopic sleeve gastroplasty, and endobarrier bypass sleeve. Currently, the endoscopic procedures and devices used for the treatment of obesity are space occupying. There is also a role for such devices in patients who are massively obese, who are unfit to undergo the bariatric surgery as a bridge therapy. However endoscopic duodenojejunal sleeve for diabetes has come as a promising alternative surgery for diabetes, but still awaiting FDA regulatory approvals. A soft, flexible catheter assembly is used to place and inflate a balloon under direct endoscopic vision. This inflated balloon fills most part of the stomach thus giving fullness and early satiety after little food intake. Patient needs to be on overnight observation and will be discharged in a day or two. Indications: Alternative weight loss treatment in moderately and severely obese patients. This is used in conjunction with a supervised weight loss diet program for weight loss in obese patients as a first step to reduce the surgical risks of other procedures. You're willing to commit to healthy lifestyle changes and regular medical follow-up, as well as to participate in behavioral therapy. You have not had any previous stomach or oesophageal surgery. An intragastric balloon and other weight-loss procedures or surgeries are typically done only after you've tried to lose weight by improving your diet and exercise habits. Procedure: After a routine check gastroscopy, a deflated round, smooth silicon balloon is introduced into the stomach. 400-600 cc of saline or a combination or air or a combination of both is introduced through a self-sealing valve to facilitate simple filling. Reusable removal tools allow for deflation, fluid evacuation, capture and removal of balloon. The patient can have small amounts of liquid starting about six hours after the procedure. The liquid diet generally continues until the start of the second week, when the patient can start eating soft foods. Regular food can be eaten around three weeks after the insertion of the intragastric balloon. 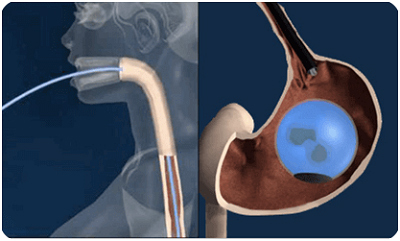 Intragastric balloons are left in place for up to 6 months, and are then removed using an endoscope. Frequent meetings with members of your medical team, such as your nutritionist and psychologist, may be needed after your procedure. Post gastric bypass, despite initial weight loss, some patients experience weight regain that may be related to an increase in the size of the gastric pouch and/or stoma. The gastroscope is used to calibrate the new anastomotic diameter. Serial endoscopic placations with 3-0 polypropylene "H" fasteners starting approximately 1cm above the gastrojejunostomy and proceeding circumferentially to approx 1cm below the gastroesophageal junction are performed. Two fasteners were placed at each location, generally spaced 1cm to 2cm apart. Following the completion of the procedure, repeat upper gastrointestinal endoscopy is performed to inspect the revised stoma and gastric pouch. Repeated measurements are taken, and the operative site is inspected for hemostasis and parietal integrity. Two fasteners are placed this helps patients to lose up to 40% excess weight that was gained or after inadequate weight loss. Duodenojejunal Bypass is now gaining popularity and comes into the realm of metabolic surgery. This was originally done as a surgery to relieve the pain of patients with intestinal cancer. But it was found that a particular section of the duodenum is actually also deeply involved in Type II diabetes. When this section of the duodenum is bypassed with surgery, Type II diabetes is often successfully cured establishing normal glucose levels. In the Duodenojejunal Bypass sections of duodenum are bypassed via an end-to-end anastomosis. The biliopancreatic secretions are also diverted into the distal jejunum through a choledochojejunostomy, a surgical anastomosis of the common bile duct and the jejunum. As with the duodenal switch, the pyloric valve is preserved, but unlike the duodenal switch no gastric sleeve or other procedure is performed on the stomach. A large weight loss is also a result of Duodenojejunal Bypass, because much of the absorption of food occurs in the duodenum. In other words, the Duodenal-jejunal bypass is a stomach sparing bypass of a short segment of the proximal intestine, a gastric bypass without the stomach stapling. Duodenal-jejunal bypass has been shown to improve diabetes in both lean and obese patients. It is currently being investigated in selected early human trials. Published data on a sampling of cases shows that normal-weight type 2 diabetic patients undergoing duodenal-jejunal bypass had normalized fasting blood glucose levels < 100 mg/dl. A1C dropped to < 6%, from a preoperative level of 8-9% . 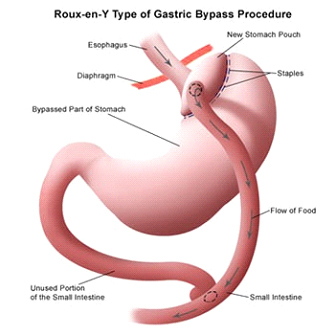 It is expected that this procedure might be a good alternative to the well-described safety profile of the Roux-en-Y gastric bypass.